The FIRST and most Advanced Mod that gives new Artificial Intelligence to animals for more realistic behavior, GUARANTEE OR YOUR MONEY BACK! Mudcrab Patch .ESM or .esp file version, depending of the patch you select. Do what you want with MY files, let`t keep the modding community open! on the contrary most textures do not belong to me, so contact their original creators. If you want to use my original files in your own mod is OK, but you must create a SkyTEST Meshes and Textures folder inside your mod and place my assets there, take it as a way to Credit, Respect and Honor my mod within your own mod. * Optimized Fear of Fire & Torch Conditions. * Fleeing animals will still appear as aggro in the compass, but once they reach enough distance it will allow you to ignore them and fast travel. * Reduced the chance of some Animals doing KnockDown Attacks. * Fixed possibility of animals giving diseases to the player. * Fixed Goats Attacking other Prey Animals. * Mammoths will no longer attack Other Smaller Prey Animals such as Foxes and Hares. * Added Slaughterfish as friend with KynesPeaceFaction. * Removed the "Respawn" Tag that caused player horses to spawn twice in stables. * Fixed several Companion SpiritWolves Keywords. * Removed a Wrong Keyword to the Mammoth Snout Food Item. * Removed a wrong keyword to the HowlSummon Wolves. * Lowered Skeever Attack Damage from 15 to 11. * Lowered Skeever White attack damage from 22 to 12. * Lowered Deer attack damage from 15 to 11. * Lowered Elk attack damage from 15 to 12. * Added a Calm Effect to fleeing Predators after certain distance has been reached between them and the player. 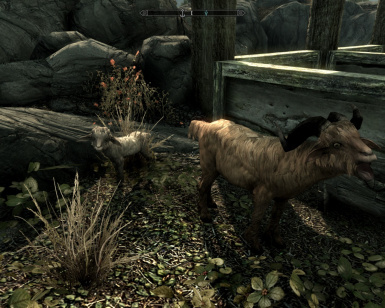 * Aggressive Wild Goats spawn chance has been greatly lowered. * Added a recipe that i forgot to add for Sheep Cooked Meat. * stopped Puppies from pushing the player by adjusting their follow Radius. * Cleaned the mod from dirty Edits with SSEEdit. * Finally found a way to fix the mind of mindness Nightmare Wolf. * Smaller Mudcrabs will no longer be able to Knock you Down. * Fixed PitWolf and IceWolf Constant Fear Effect. * Fixed more minor issues with a few Predator Hunting Ai Packages. * Added a small Chance to spawn a Coward or Cautious version of all Predators to SkyTEST LeveledList. * Lowered most predator health a bit. * Fixed IceWolf Fear of Fire. * SkyTEST wolves pelts can now be tear down to Leather in tanning rack. * Cleaned USLEP conflicts with TES5Edit. * Fixed issue with puppies appearing next to you after using Fast Travel. * Fixed Kyne's Peace and Voice of the Sky. * Fixed Dawnguard werewolf keyword that prevented an exploit. * Disabled knockdown attacks while riding horse. * Fixed some Predator Hunting Ai Packages. * The mod has been Merged with Legendary Edition and it now requires all Official DLC's. If you only own Skyrim and no DLC's, then stick to v1.55. * Fixed Cooked Mammoth Stake was not being tag as Food. * Fixed some grammar offenses in Food items. * Fleeing Animals will now defend themselves if cornered. * Goats will drop Horn item upon death. * Fixed Kodlak Wolf Spirit Actor ID, he is now excluded from the list of AnimalFearEffects. * Animals can no longer Constantly Knock you down while you're already knocked down. * Fixed Some wolves such as Familiar and Guardian Spirit being affected by fear of fire. * Unchecked Dosent Affect Stealth Meter for Deer, Elk, Hare and Foxes. * Improved Animal Demoralize Effect for Certain Behaviors. * Fixed issue with animals Glowing Green. 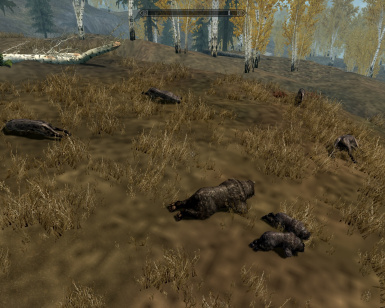 * Fixed MQ101 Bear Tutorial spawning Dead. * Fixed Regular Chicken Starting Health. it was spawning Dead. * Fixed Wolf and other Animals Sounds effects. * Regular Wolves will get a Boost of Confidence if they got two or more members but will get Demoralized once there is only one member. * Special WolvesPack will get Demoralized if there are two members, but will get a boost of Confidence and will never back down if they got three or more members. * SabreCats will get a boost of confidence if there are two or more of them, but will never get Demoralized if their numbers drop. * PlayerOwnedHorses Assistance has been set to HelpNobody. * Fixed Familiar Wolf and FireThrall getting affected with Fire. * Fixed Zombie Animals becoming Scared with Fire. * Added a unique version of FearOfFire effect to Mammoths to prevent some issues. * Mammoths can now Crush you down intentionally or unintentionally, stay out of their way. 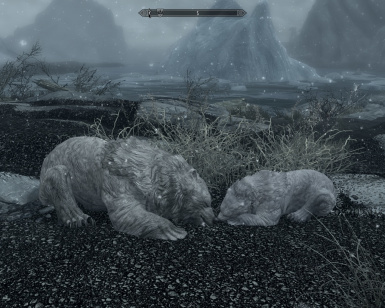 * Fixed SnowBear Cub Health, it Spawned dead. * Fixed SnowSabreCat Cub Health, it also spawned dead. * Added a unique version of FearOfFire effect to SabreCats to prevent issues. * Added a unique version of FearOfFire effect to Bears to prevent issues. * Added a unique version of FearOfFire effect to RegularWolves to prevent issues. * Added a unique version of FearOfFire effect to WolfPacks to prevent issues. * Some Predators will avoid Player if he has Intimidate Perk. * Special WolvesPacks will disband and retreat if their numbers fall below 4. * Added Stagger attacks to most animals. 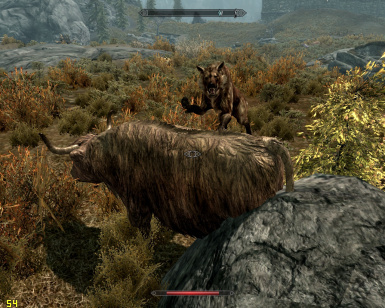 * Skeevers, Wolves, Sabrecats and Bears have a chance to cause bleeding with their bite attacks. * re-checked all Horses Factions and aggression. * Placed some Small Crabs around Whiterun. 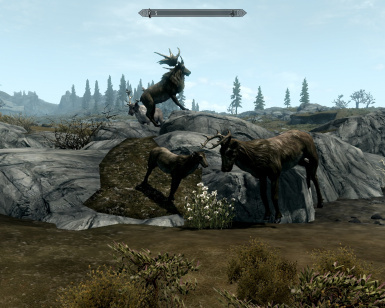 * Placed few Elks/Deer spawn points through all Skyrim. 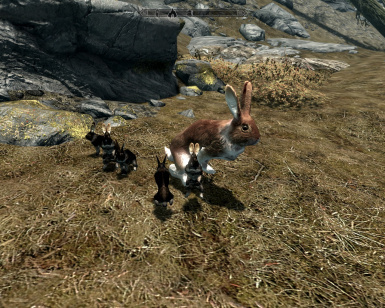 * Placed few Fox and Hare spawn points through all Skyrim. * Placed some more Small Spiders through all Skyrim. * Fixed Recipe PorkLeg Cooked. * Added Slaughterfish DeathItem Raw Food. * Fixed Sheep Raw Meat Texture and Model. * Fixed issue with horses going aggro. * Placed some Small Spiders. * Placed some Small Rats. * Mod completely re-done from scratch. * Animals will run away when set on fire, but they will return once effect goes away. * Animals will run away from Monsters such as Trolls, Giants, Dragons, Daedra, Vampires, Werewolves or Undead. * Most animals will run away from you when equipping a Torch, but some may not be too impressed and may still attack. * Added some new Wolf Sounds. * Improved stability of the mod. * Increased the amount of spawned death food Items in the animal inventory for Big Animals. * Keept the spawn points of animals to a minimum to avoid conflicts and CTDs. * Improved Stability of Ai Packages and AI of the Animals. 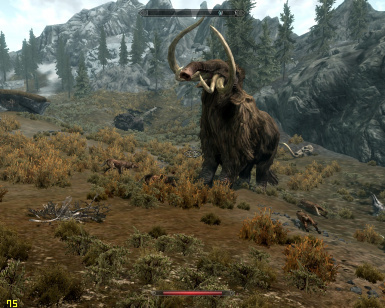 * Mammoths will trash you around with their attack, using Melee and close combat with them is a very bad idea. * SabreCats and Bears have a chance of knocking you down when using their Rush attack, they will maul you to death. * Converted the mod into an esm file, should provide more stability. * Reverted to default few more Cells that were causing issues with Lake View Manor home (Heartfire). * Added new Retexture to the Sheep. * Increased most Animal speed. * Reverted to Default some spawnpoints that were placed close to Heartfire homes. * Fixed Sheep rubber glow effect. * Optimized most Ai Packages. * New Pig idle sounds. * Fixed Baby Mammoth using the wrong Mesh with tusks. 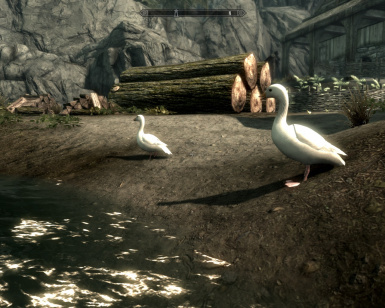 * Added a few Goose Spawning points in Half-Moon Mill. * Optimized the Food Chain. * Forced Fermi & Kepler to only search for the Player once a week. * Resolved issue with the New Animals Sound Effects & should now fade with distance. * Roosters will now Crow daily, starting from 5AM till 8AM (without the need of Scripts). * Added Scaredy Lone Wolf Spawn points. * Added back Small Spiders. * Fixed AI issue that would make Elks, Deers, Hare, SmallCrab to stop responding. * Fixed Fermi & Kepler Factions, so they would not attack Player Horses or Companions. * Massively improved Baby Animal Proportions. * Rebuild the mod from Scratch. * Animals will now drop random Items at Death in a way that makes sense. * Adjusted CombatStyles AI for most Predators. * This version focus on Stability, i redid the mod from scratch and did not had time to other features, so you will not see Baby Animals, Herds or Wolf Packs, those will be added back in next version. * Fixed few Spawn Points, deleted few others. * SabreCat Female & SabreCatSnow Female have new Mesh. * Fixed many Ai Packages. * Removed all edits from Cell (-9, 21), (-9, 23), (-8, 24), (-8, 25), (-8, 26), (-8, 27) that conflicted with yet another HeartFire home. * Moved the Elks from cell 7,8 - 7,9 that were causing issues with Heartfire. * Removed few Deers, Elks and Rabbit spawns. * Finally got rid of Petrovsk? * Added more Small Crabs spawn points to small ponds. * Forced Petrovsk to appear only to lvl 30 Players and higher. * Added few more Spawm points through all Skyrim. * Fixed Small critters messing with stealth metter. * Due to popular wimp whining, Petrovsk will only appear on high levels. * Fixed minor issues with MammothFaction and Prey/SmallPreyFactions. 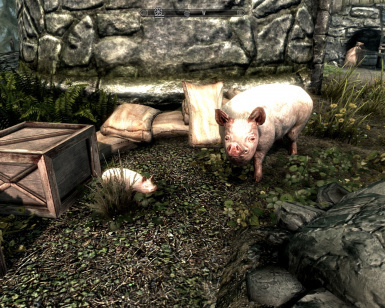 * Fixed issue with Slaughterfish and NPC Actors in Windhelm. * Fixed some AI Packages of "Smart Animals" in Rorikstead. * Stopped cubs from giving loot. * Forced Hare/Fox/Deer/Elk to avoid Water. * Forced cubs to stop making heavy foot step sounds. * Gave Slaughterfish an Aggro Radius, should prevent the annoying issue with red dots all over the compass. * Added more Spider/Rats SpawnPoints. * More Tweaks to Acceleration/Deceleration Rate to Most animals, their speed looks more realistic now. 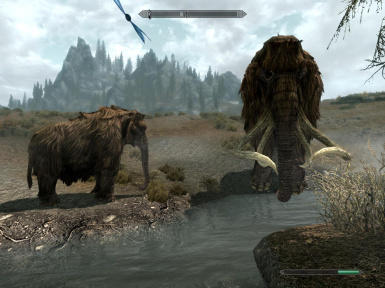 * Forced Mammoths to stop becoming aggresive when the player attacked SmallPrey. * Fixed issue with all mudcrabs appearing dead. * Fixed some ai Packages that i did not fully finished. * Balanced amount of WolfPacks. * Bears will hibernate in winter. * Removed few hunting Ai Packages from predators so they only hunt twice a day for balancing purposes. * Bears and SabreCats will keep wolves numbers in check to maintain their population balanced. * Fixed more Wrongly placed BirdFlocks. * Fixed issue with "coward" animals not fleeing when they should. * Fixed issues with some animals having odd Ai Combat. 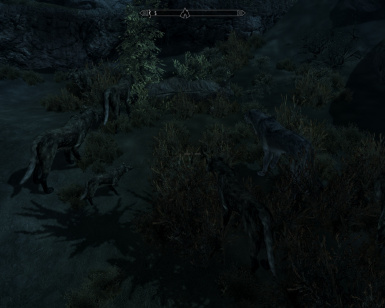 * Reduced wolf Packs Spawn points, too many of them everywhere causing havok. * Fixed issue with Wolves Leader Packs not attacking correctly. * Fixed few Birdflocks that were placed wrongly, causing them not to fly when approaching the trigger. * Placed more Prey spawn points through all Skyrim. * More optimizations to File structure. * AI Package improvements on find item food/flora. * Added SabreCatCub and Snow that follows mother. * Predators will no longer attack on sight, they will give a warning if you get too close, you have about 5 seconds to retreat before they will count you as a threat. * Added Flying Hawks to most of areas. * Twice a year all wild animals will try to mate with their species, date will vary for each species. * New combat behavior for predators. * Further Increase the AI Package of most Animals. * Packed Meshes/Textures into a BSA file for Easier Install/Uninstall. 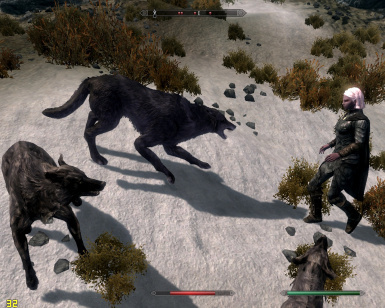 * Added Smart Dog in Riften that you can play with if you have any type of food. * Fully Completed the Animal Food Chain. * Prey animals will look for Flora 3 times a day. * Optimized and Rebuild ID structure to prevent Mod compatibility issues. * Further Increased the Speed of Deer/Elk. * Further Increased the Speed of Predators. * Added few more spawn points through all Skyrim (mostly ambient creatures). * Adjusted Animals Health for little more realism. 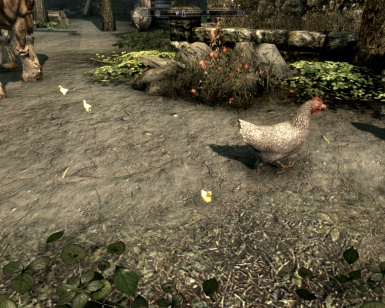 * Added even more Bird Flocks through all Skyrim. * Revised Factions of most Predators. * Fixed minor issues (Invisible Bear Mothers). * Bears acceleration speed has been decreased. * SabreCats acceleration speed has been increased. * Deer/Elk acceleration speed has been increased dramatically. * Wolves acceleration speed has been increased slightly. * Added small rats and roaches to the Ratsway in riften. * Further optimization to the file structure to smoother gameplay. * More true animal behavior than ever before, predators now have a schedule of hunting and to find things to eat. * Added animal textures created by "wrig675", and Hare/Rabbit Textures created by "chocolambot", THANK YOU BOTH. * Expect the unexpected with some animals... it will amaze you what they can do now. * Fixed small issue with factions. * Added baby mammoth that follows mother. * Wolves, Bears and SaberCats will hunt for Venison, Beef, Goat Leg, Horker Meat, Horse Meat, Rabbit Leg and Mammoth Snouth & will kill the creatures who carry the items at least once a day, they will even search for corpses. * RatSmall will hunt for SpiderTiny, SpiderSmall and CharusRoach once a day. * SpiderTiny will hunt for CharusRoach once a day. * SpiderSmall will hunt for SpiderTiny and CharusRoach once a day. * Some Foxes will hunt for SpiderTiny, CharusRoach, SpiderSmall, Hare and RatSmall. 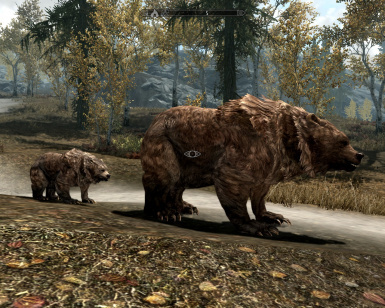 * Added some spawn points for Bear Black/Brown/Snow "Mother" and cubs who will follow them everywhere. * Added few more flyaway "BirdFlock" points thoughout the big forests. 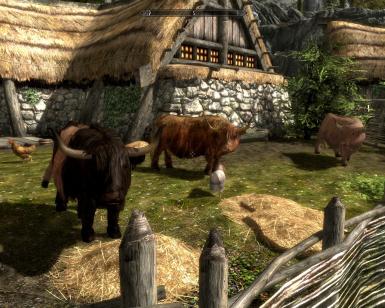 * Added Some non aggresive critters to Solitude, WhiteRun and RiverWood. * Heavily modified the Factions for more true interaction between species. * Wolves now have an Alpha Wolf and will follow him where ever he goes, only the Alpha Wolf carries Ai Packages so he can lead the pack in search for animals or food. * Tweaked spawn rate for more regular run away foxes. * Tweaked spawn rate for more regular run away goats. * Tweaked spawn rate for more regular run away deers. * Tweaked spawn rate for more regular run away elks. * Fixed lonely wolf that may attack, now all single and couple wolves will always run away. 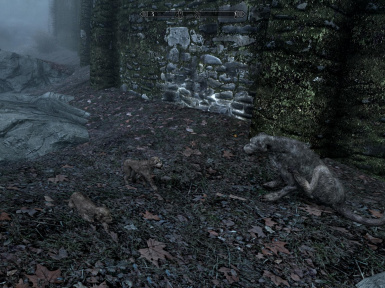 * Made many new spawn points throughout Skyrim for differen types of animals. * Single wolves will always FLEE. * Small Packs of wolves (2-3) will be cautious, this means they will flee when are losing the fight. * Big Packs of wolves (5-7) will be extremely agressive and will stop at nothing. * Chance to spawn a BlackBear (1-3 chance) that will be Coward. * Chance to spawn a BearCave (1-3 chance) that will be Cautious, this means they may flee when are losing the fight. * SnowBears are always brave and really aggressive. * Chance to spawn a Deer/Elk (1-3 chance) that will always be Brave, while the rest will be Coward. * Added SmallCrab Spawn Points to rivers and lakes. * Male Deers and Elk will give you a warning if you come close to them, if you keep approaching they MAY attack, denpending of your level. * Foxes will try to scare you away if you come too close to them, but will eventually Flee (they may attack, but does not happends too often). * Mudcrabs will stop attacking you on sight and will only attack if you really get close to them. * Wild Goats will give you a warning and may attack if you get too close (depends on your level). Many thanks to everyone who has Endorsed, Voted or have given small Donations, who ever you guys are, thank you all!! 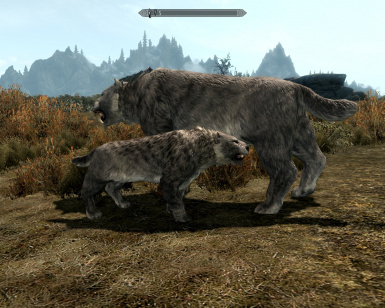 SkyTEST stands for "The Elder Scrolls Tweaks" and as the name states is a series of Tweaks who´s purpose is to tweak and balance the game in different "Aspects", in this case "Animals & Predators". The name SkyTEST comes from my first Oblivion Mod called "TEST" The Elder Scrolls Tweaks. 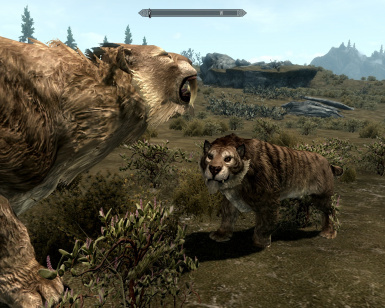 "SkyTEST - Realistic Animals & Predators" was the first animal mod which gave new AI (Artificial Intelligence) to Animals & Predators, the mod main focus is to overhaul Vanilla Skyrim Animals behavior to act a much more realistic while leaving the Original Design of the Animals and Stay LORE Friendly. The mod does not focus completely on adding more variation to animals since there way too many mods for that, but its also not limited to only altering the Ai, the following things is what this mod offers once installed. * Animals WILL NOT report crimes! heck this was one of the very first features of the mod back in 2012. and i believe Bethesda even addressed the issue in one of their early patches. * 100% Compatible with HeartFire/DawnGuard/DragonBorn. * 100% Lore Friendly and immersive, the mod feels like its has always been part of Vanilla Skyrim. * No Save Game Bloat, since every single feature was accomplished without scripts. * Can be Uninstalled at any given time without causing issues to your save game. * Improved Combat AI for more challenging animal combat behavior. * Tweaked animal Stats to make them Harder. * Animal Food chain 100% Completed. * Mammoths, SabreCats, Bears and Mudcrabs have a chance of knocking down the player. Just like in real life big animals will maul you to death, so be careful. * Animals will NEVER Fight to the Death, they will flee as soon s they feel they had enough. * All Animals now Fear Fire, they will flee for a bit but will come back after few seconds to try again. * Pack Based Predators can get a boost of Confidence as long as their numbers are high, on the contrary they will get Demoralized if they lost too many members and they may flee, Lions and Wolves have this behavior in real life. 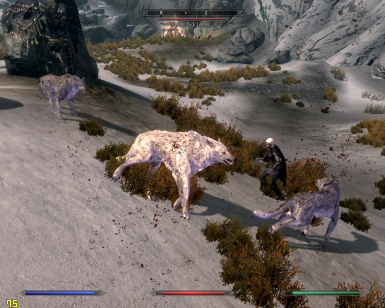 - Packless Wolves will ALWAYS run away from the player, but if another nearby wolf joins them they may attack you. - Pack Wolves will never back down unless their numbers drop considerably, at this point the pack will disband and will try to flee on their own. * Animals will be scared by Dangerous Monsters such as Dragons, Giants, Trolls, Werewolves, Undead and Daedra. * Created new spawn points through all Skyrim to give a little more life. * Most animals will try to find a mate within their species once a year. * Predators will go out and hunt 2-3 times a day, if you happen to kill a predator and find some sort of animal meat in their inventory, then is very likely that predator has gone out to hunt successfully prior to his death. * Ambient/Prey animals that search for Flora few times a day. -2000 (Aprox 60Mt) They pay attention to everything you do until you leave this radius. -1000 (Aprox 30Mt) You`re getting too Close, they will start giving you warnings to back off, if you don`t they will attack after about 6-8 Seconds. -800 (Aprox 20Mt) You`re too damn close, instant attack. * Animal parents being followed by their cubs, you can encounter mammoths being followed by baby mammoths, Female Horkers being followed by their cubs... Deer and Elk Fawn and Calf, maybe even Bears with their cubs. * Most animals has been given a boost of their Max Speed like Deers, Elks, Bears, SabreCats, Wolves, etc. 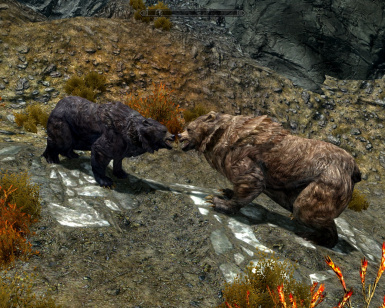 * Animals has been increased/decreased their Acceleration Speed, example Bears will take a little more before achieving their max speed since in Vanilla Skyrim Bears achieve their max speed instantly, which is of course "BS" and now it should feel more realistic, the contrary applies to Deer/Elk, SabreCats, Wolves and many more which should achieve their max speed faster. * Small Critters through all Skyrim, you can encounter small spiders, Roaches, Rats and even Crabs which serve as prey for smaller predators. 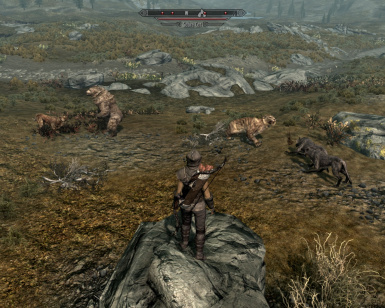 * Better Factionalized animals, now there is a chance for predators to attack each other if encountered, in vanilla Skyrim you would get owned by wolves, bears, sabrecats, spiders and chaurus all at the same time, they acted like if they were a happy predator family who shared the meal... ANNOYING AS HELL, No more. * More variation to Farm and wild animals. The mod was getting bigger and bigger since i worked on the mod on a daily basis, updates were frequent at the time, but currently no plans to update the mod. If you want to check the mod in full action check the VIDEO SECTION. Animals in this mod are unpredictable, they have a mind and agenda of their own. 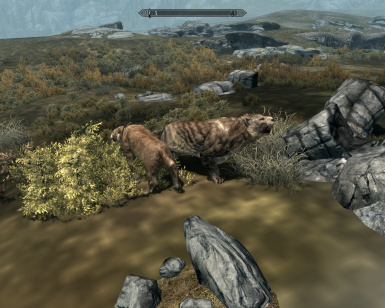 The very First Version of the mod started with me getting pissed at the fact that in Vanilla Skyrim all Predator Animals ignore each other and group against you, an example would be that 3 wolves, 2 types of bears and 3 sabrecats all target only you and ignored each other, so i decided to fix the issue, the following video shows the very first version of the mod which addressed the issue. As you can see, the mod has evolved quite a lot since the first build, and it has created the illusion of a Realistic Animal Behavior and Food Chain. * Disable ALL MODS and leave ONLY SkyTest enabled, if the problem disappears then it was not SkyTest, if problem persists then it was likely SkyTest is the culprit. I request doing that before reporting because some people blame the mod before even doing some tests on their own, you cant expect me to take reports seriously if i just get a bunch of people claiming something like "oh i installed this mod and i had a CTD" or "this mod conflicts with X Mod please fix it". PLEASE DO NOT use the COMMENT SECTION any longer to report issues, sometimes i will not be able to see your comment because i get too many comments making it hard to follow older comments, INSTEAD of commenting, send a PM with DETAILED DESCRIPTION OF THE ISSUE, any report in the comment who does not try what i suggested and does not describe the issue enough, will be ignored... sorry that´s just how it is. Caused by: Engine Vanilla Script? Solution: Kill them, otherwise combat mode will never end. Description: Slight chance to encounter animals that seems to be Aggressive toward the player, it also spreads like wild fire and will keep making nearby Prey Animals to go hostile, i have no clue what causes this issue. SkyTEST Prey Animals are set as Unaggressive and Cowardly, they should never go aggro to the player under any circumstances, they should not go aggro even if the player attacks them. So it must be something in the engine that makes them go wild, i assume some sort of Script that manages Factions/Aggression/Combat. It causes no harm to your game, so don`t worry... but it is annoying. Solution: Bumping and Pushing the actor animal will force him to respond again. Caused by: Running another mod in at the same time with SkyTest that also Changes the default LeveledCharacter Lists. 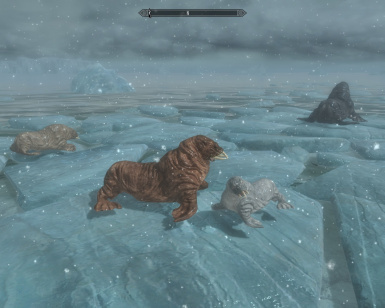 Description: There was a chance of encountering an animal that seems to be behaving well, but will be Stuck in the idle mesh pose and would not show any animation at all (probably because it was trying to use another actor animations), it would look as if it were Skating, this ONLY happened when running another mod that would also made the mistake i did of changing the default LeveledCharacter lists (SkyMoMod used to caused this issue), it would cause the engine to spawn a mixture an actor from both Mods, causing the actor to not to be able to show any animation but will act as it should. Status: All Versions of Skyrim. Solution A: Create a New Game (You`re Screwed), so next time try choosing your mods Wisely and preferably avoid Scripted mods, you cannot disable or remove mods with scripts from your save game, since removing them will make the problem even worse, the least you could do is live with that mod attached to your save game for ever. 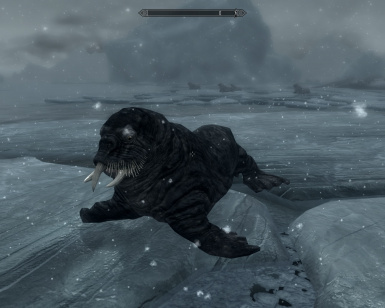 Description: This issue is caused by Bethesda own bad scripting techniques, Bethesda Original LvlPredatorScript seems to cause Bloat and corruption on it`s own, also having a Huge List of Active Scripted Mods increases the chances for this type of CTD, they are also caused by Installing and later UnInstalling mods that contained scripts (Worst thing you can do to your Save Game), this causes the Save game to try to obtain Data from such mods/scripts which later causes the game performance to drop considerably and finally ends in a Crash to Desktop. Solution A: STOP MESSING WITH THE GRIDS, Seriously... STOP MESSING WITH THE GRIDS. 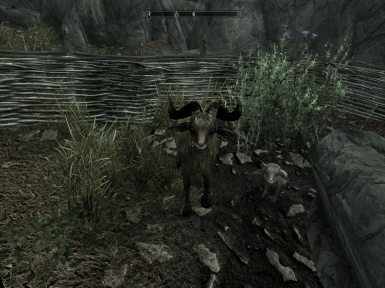 Description: People messing around with the "UGridsToLoad=" setting in the Skyrim.ini, changing it to anything above 5 will drain your Ram, which in turn makes it easier to hit the Engine 3.1GB Ram limit and will cause instant CTD, Guarantee by Bethesda, the higher you set it the easier you will be having random CTDs, even using uGridstoLoad=7 will cause a CTD, SO DON´T MESS WITH IT AND LEAVE IT AT DEFAULT OF 5 if you really hate Random CTDs. Yes even in 2016 YOU WILL CRASH if you mess with the UGrids, no matter how much you tweak Skyrim or how many of the above Community Fixes you use, it will only delay CTD but it will never get rid of them if you Changed default Value of 5 UGrids. Solution: Download the Mod MANUALLY from the File Section. Description: People getting Attacked by Invisible animals, this is caused by NMM that somehow manages to downloaded the wrong BSA and ESP. Status: Present to some users. Solution: download 7z Version 9.20 or newer and then try to extract the files through 7z Window, as last resort if you keep getting errors trying to decompress the files try extracting directly through NMM. Description: As soon as you download the mod and try to extract the files, user report not being able to do so, some users claim NMM is able to extract the files with little issue, which in turns makes me feel it is an NMM issue by itself. My mod list is quite low, and i never experience a single CTD after Skyrim Update v1.4, i did had a couple of CTDs while playing for a few hours in a row prior to updates 1.4, but after these Update i have not seen a single CTD, not even with mods that are known to have heavy CTD reports, which confirms my theory that CTDs are caused by using a TON of Mods. I did how ever had couple CDT´s with Dawnguard enabled, but these were random and could not be replicable, it seems Dawnguard is rather "dirty" and "unstable by design, yet the crashes appeared in a very low rate. THAT`S RIGHT, THE LESS MODS YOU USE THE LESS ISSUES YOU WILL HAVE, I GUARANTEED IT %100, CHOOSE YOUR MODS WISELY & PREFFERABLY AVOID SCRIPTED MODS. WATER - 100% But you MUST load WATER after SkyTest (using what ever mod sorting app you use). PureWaters - 100% But you MUST load PureWaters after SkyTest (using what ever mod sorting app you use). 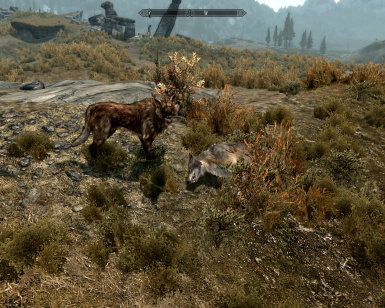 Tame the Beasts of Skyrim - 100% But you MUST load it after SkyTest (using what ever mod sorting app you use). Tame the Beasts of Skyrim II - 100% But you MUST load it after SkyTest (using what ever mod sorting app you use). 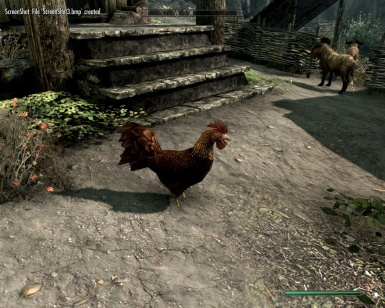 As of v1.56 the mod requires Latest Version of Skyrim 1.9.32.0 + All DLC's, If you use an older Skyrim version you may be attacked by invisible animals. Extract the BSA and the ESP files into the DATA folder and DELETE any previous versions of the mod if you have it. 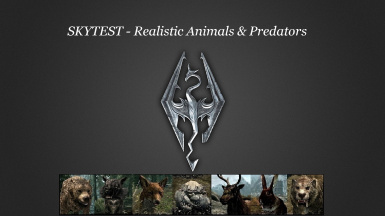 * 1- Download the compressed "SkyTEST - Realistic Animals and Predators Uninstaller" in the Files Download section, replace the original SkyTEST-RealisticAnimals&Predators.esp (or .esm) with the Uninstaller ESP and overwrite when it asks you. * 2- Run the Game and Save. * 3- Finally remove anything related to SkyTEST. The Special Uninstaller esp is an EMPTY esp that forces any changes from SkyTEST, into the default game settings and preventing CTDs while making sure no traces of the mod has been left. This is the 100% SAFEST Uninstall way. Also this process can be used with any mod as long as it does not contains Scripts. Start messing with Quests for Random Animal Encounters. wrig675 for her Bellyaches Texture Pack. "Jsnider193" whom without his help not even half of this mod would have been made possible, he just keeps supporting!! awsome you rock Man! !